Avid 'Top Gear' fans must often wonder what it's like to ride in some of the world's fastest cars and at Castle Combe on Saturday October 23, they have a chance to find out. The annual Stroke Association 'Supercar Saturday' allows anyone the opportunity to experience five scintillating passenger laps in everything from a Ferrari 360 Fiorano to Maseratis and Porsches, helping a good cause at the same time. A number of the cars and drivers will already be known to regular race day spectators. The 2010 Castle Combe Pre '90 Formula Ford champion, Kyle Tilley from Chippenham, is one of the event's 'Star Drivers', on hand to drive people in their own cars to give them an insight into the high speed demands of one of the country's fastest circuits. One of the 'hairiest' cars will be the mighty 8.3 litre Dodge Viper GT3 of Bath's Nadine Geary, which can lap the 1.85 mile track at an average speed of almost 90 mph in the circuit's Sports and GT championship. 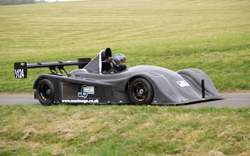 Even faster will be the Radical sports racing cars, such as the SR4 of Rachel Davies, the 2009 champion of that category. These cars are easily capable of lapping at an average speed of 100 mph, leaving even the most sophisticated road going 'supercars' trailing. One of the world's most accomplished historic race car drivers and a supporter of the event for many years is Barrie 'Whizzo' Williams. Having competed for over 50 years in more than 800 races, 'Whizzo' has driven almost every type of car and is a trusted pair of hands for owners of priceless classic racing cars who wish to deploy them at some of the top events worldwide. Rides are available from £20, depending on the car/driver combination. The day starts at 10-00 AM and carries on till dusk. General admission is £5 for adults and free for children, with easy free parking on site.